With the election drawing ever closer, David Cameron and George Osborne visited Leeds yesterday to discuss their vision of a ‘northern powerhouse.’ Our own MD Daniel Rajkumar joined the Institute of Directors to hear his speech. 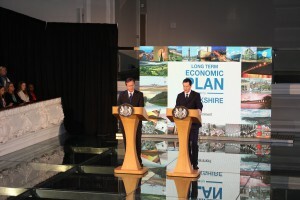 Addressing business leaders from the region, the Prime Minister and Chancellor spoke about their ambitions for Yorkshire and their plans to create 100,000 new jobs.They stressed the importance of closing the North and South divide and the need to sustain the region’s current growth. Mr Cameron spoke of achieving this through improving transport along with the backing of science, tech start-ups and creative industries in the area. “Our long-term economic plan for Yorkshire and Northern Lincolnshire, which will create more jobs and financial security for hardworking people across the region, is a key part of our work to build a Northern Powerhouse that can take on the world. “We want a truly national economic recovery. The evidence is that this is happening. Yorkshire is growing and creating jobs and on many measures doing so more quickly than the rest of the country. Now we need to sustain this and remove the decade’s old North and South divide. That is why the Prime Minister and I are here today setting out how we will build a Northern Powerhouse. The PM laid out his plans in the historic Salem Chapel in Leeds. The Chapel is the head office of aql, a telecoms, data and software company that services over 35 of the FTSE 100. aql house their DC3 data centre within the building which can be seen from the auditorium. It is also the location of rebuildingsociety’s April event, which will provide information about the company and an introduction to the peer-to-business lending market. You can find more information about the PM’s long term economic plans for Yorkshire here.